"What we wanted to do was identify a way to teach and train athletes – we never set out to be a virtual reality company," EON Sports VR CEO and co-founder Brendan Reilly says. That's not exactly what you expect to hear when you're talking to one of the minds behind SideKiq QB, EON Sports VR's virtual reality (VR) software for training American football quarterbacks. But, perhaps it takes individuals that aren't mired in the minutiae of VR, but rather simply driven to improve athletics training, to spur real change. Reilly co-founded the Kansas City-based firm in 2013 after working with University of Kansas basketball coach Bill Self training student athletes on the practice court. Today, he and his team of engineers are advised by storied football coach and quarterback trainer Terry Shae as well as MD-and-Ph.D.-holding medical and neuroscience advisors. "We became a virtual reality company once we learned that's the best to teach and train not just athletes, but anybody – people who are pilots, surgeons," Reilly says. "It's simulated learning, [and we're] incorporating that as a piece of the regimen within the training process." To date, EON Sports VR has convinced three teams in the MLB (the firm has a hitting app, too), collegiate organizations like the Big Ten Conference and even the NFL's Tampa Bay Buccaneers to adopt its technology. And, the benefits have shown through almost instantly, Reilly says. SideKiq QB is, essentially, a football playbook simulator that translates football plays into three-dimensional simulations – as if the player were on the practice field with his fellow teammates. First developed using high-end VR headsets, like the Oculus Rift, the app is now available on iPhone and Android coupled with almost any compatible headset. "The reason that's compelling to these guys is that they don't always have 22 guys at their disposal, running plays whenever they want," Reilly says. "Especially during the season when everyone is injured, getting guys to run the exact plays the right way – all of that is really hard." Reilly tells me that the SideKiq Game Engine started with this hypothetical question: "Is there anything that I can just quickly and easily create these situations, and then put you – the user – into the viewpoint of what you would actually be seeing in a real-life game?" This is exactly what the SideKiq QB app does. To measure effectiveness, the app employs eye-tracking through the smartphone's cameras to ensure the quarterback is looking in the right places at the right times, according to play drill being run. And it all happens at the speed of a real-life practice drill. Then, Reilly says, the app incorporates active quiz components on what he calls "the display side," or when the phone isn't strapped to your face. "It's dynamic enough to respond – if you're not progressing or understanding what concept is being thrown at you," Reilly says, "for the most part, you're not going to be able to advance to the more complicated schemes of the coaches." According to Reilly (naturally), not only is SideKiq QB effective, but it is by a magnitude no one on the team was expecting. EON Sports VR conducted a study with a group of student athletes of varying age and athletic ability using its SideKiq headset and app. Reilly and crew put kids through a series of tests using over three days, jumbling up a regimen of 30 plays to keep them on their toes. Just like using the app, the students would have to decide, "'Hey, I'm throwing to so-and-so,' then identify the coverage," Reilly says. At the end of those three days, the EON Sports VR team was hoping to show a one or 2% increase in the students' decision making as enough validation of the app's effectiveness. "Well, we saw in just those three days of tests, there was an up to 60% – and the group's average increased by 30% – increase in their ability to diagnose what they're seeing, make decisions, et cetera," Reilly says. "So, you start think, 'What is the compounding effect if you did that for four years, all throughout high school, and got to see your opponents' defenses,'" Reilly asks rhetorically. "That, if used in the proper context, is really powerful," Reilly says, and EON Sports VR's partners seem to agree. 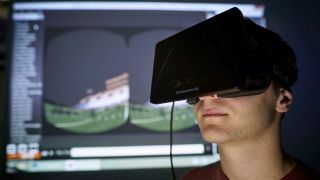 "We used EON's VR technology last year at Syracuse and had a ton of success with it," Purdue University quarterback coach Tim Lester said recently in a statement, "especially when it came to getting our true freshman QB ready." Last year, UCLA offensive coordinator Noel Mazzone remarked in a statement that, "this technology allows us to prepare our quarterbacks not just for next week's opponent, but prepares them for the NFL. We can now simulate any situation; the possibilities are endless." Ultimately, what SideKiq QB aims to do is bolster quarterbacks' decision-making speed and accuracy. That's just as important – if not more so – as his ability to run the ball or get it to a wide receiver another 40 yards down the field. Just as the iPad – ahem, Surface – replaced the playbook, virtual reality is poised to become the new film study for football players.